It was a lazy sunday morning and as usual, a question poped in my mind - What to cook??? Luckily, my hubby came to my rescue. We decided to cook something light for lunch and pamper ourselves with an exotic dinner. It was a joint venture project, where we cooked our dinner together adding our potions of love. 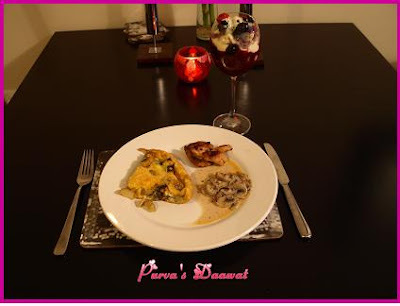 So here's the list of the foodie treat - Potato and mushroom chessy Tortilla, Creamy Mushrooms, Chicken Fry and Verry Berry Surprise. 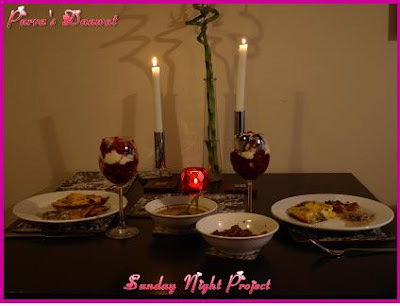 Let me share with you these exotic dishes, so that even you can have such delicious, pampering, Loving Sunday Candle Light Dinner. Creative Commons Attribution-Non-Commercial-No Derivative Works 2.0 UK: England & Wales License.